Today I'm mish-mashing about a book giveaway, backyard wildlife, wisteria pruning, and my buckthorn song. Jane Marie, a fellow Michigan garden blogger at Thyme for Herbs, recently contacted me to see if I would donate a copy of my little book, Fun with Winter Seed Sowing, for a giveaway she wanted to host. Well, of course I was interested, and she quickly got a post together. For details and to enter, just stop by Jane's post, Book Giveaway - Winter Seed Sowing. You have until midnight on Friday, March 5th to enter. I've been having new wildlife visitors this winter. The other day, I spied with my little eyes what I believe to be a Cooper's hawk sitting on my utility wires. I didn't get a good look because I rushed to get my camera right away. 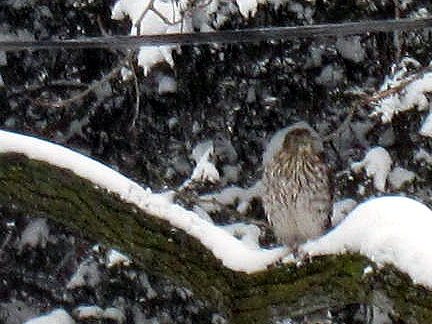 A few minutes later, the hawk had perched on a tree limb, even farther away. This is the best shot I could get. I used to see Cooper's hawks more frequently two houses ago, where I lived in a more open area. This is the first time (in nearly 8 years) I've seen a hawk at my current location. 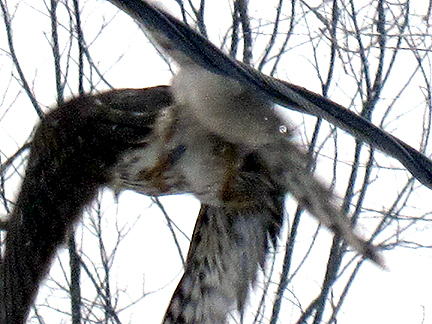 No other birds or squirrels were languishing at the feeders during the hawk's short visit. 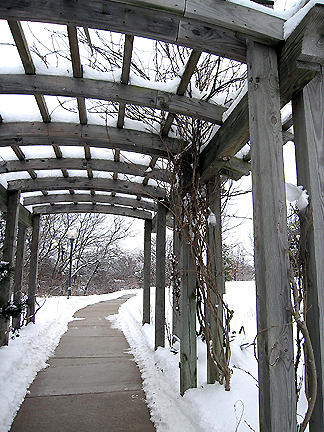 On Thursday, in about a foot of snow, a few intrepid volunteers and I joined Kathy Squiers of Washtenaw County Parks and Recreation to do a little pruning at County Farm Park in Ann Arbor. I don't mind the snow at all and I try to earn most of my master gardener volunteer hours in the off season, so I can spend gardening months in my own garden! The main task was pruning a very overgrown wisteria, which had never bloomed. The most commonly planted wisterias are Wisteria sinensis (Chinese wisteria) and Wisteria floribunda (Japanese wisteria). It was uncertain which kind is planted at County Farm Park. There's also American wisteria, Wisteria frutescens, which is native to the eastern half of the U.S., including Michigan. That's the one I'd grow, if I had enough sun or something sturdy enough for it to grow on. Wisteria is a climbing vine that can reach 60 feet. 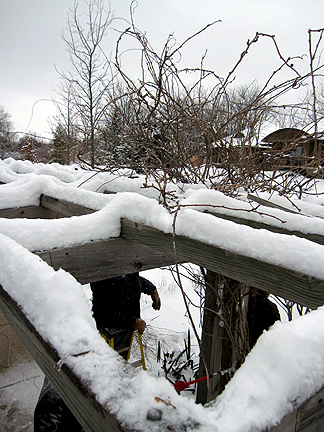 Its base twists around its support (trellis, arbor, house) and then spreads outward. Wisteria grows quickly and can get quite heavy and large over time, sometimes overpowering its support. ...and way too much tangled, or as A Chef in the Garden so aptly put it, Medusa-like top growth. 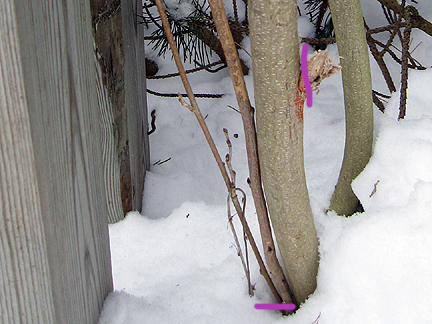 We started by removing thinner vines that were competing with the main vines (those shown with the horizontal fuchsia mark above), using saws or loppers. If a weaker wine was wrapped around a stronger one, we got rid of that, too. These vines were short and did not yet reach the top of the trellis. We only want them to grow up, not out at this point, so we also cut off side growth (vertical line above). Then we moved upward, getting rid of weaker vines and cutting off buds that would create lateral growth. 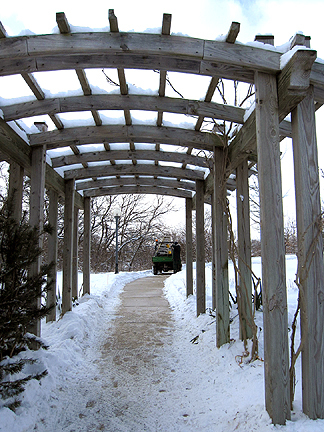 We only want lateral growth (or "arms") extending from the trunk once it reaches the top of the arbor. 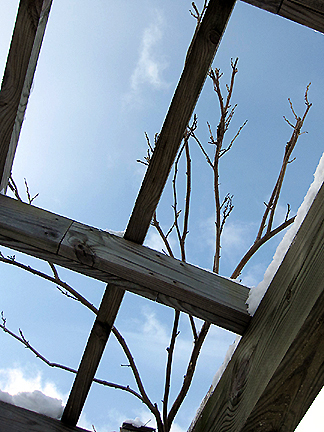 Up there on my sky perch, I cut away more lateral growth, taking out unwanted shoots altogether and trimming back remaining growth to 3-5 leaf buds per "hand" (the structures growing off the "arms," which will eventually also have flower buds). See? If these wisterias had had flower buds (which tend to be fatter than leaf buds, and are located at the base of the shorter branches or "hands"), we would not have pruned those. There still would have been plenty of shoots with flower buds to remove, however. 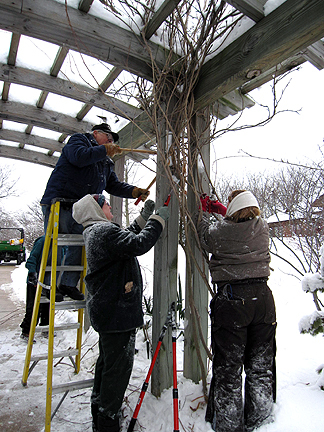 Even if your wisteria has previously bloomed, you still want to prune it in winter (February is ideal in Michigan). It's easier to see the vines when they don't have the leaves on (trust me! It was very confusing even in winter to determine where one vine started and another ended) and it's important to open up the canopy so the sun can get in in spring. 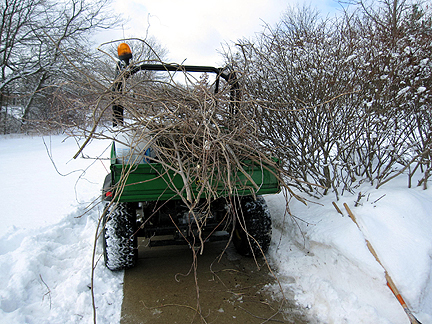 These are a small portion of the pruned vines (we had just started loading them up). Clean up is somewhat anticlimactic after the thrill of pruning, I can tell you. In early to mid summer, the blooms will have died back and the vine will again become unruly and Medusa-like. You can now prune the new growth back to 6 inches to create the short branches that will create next year's hands or blooms. We hope our wisteria will bloom in spring, 2011. And, finally, in case you missed my post on Saturday (I know! I don't normally update so frequently! ), check out the video recording of me performing Scorn of Buckthorn. If you dare. I'm back to using the old Blogger editor. Yay! Spell check rules (even if I do make up words), as does loading five photos at a time. Happy March Mish-Mash Monday, bloggers and bloggettes! Gosh, looking at the snow - and having to prunea wisteria in it - made my fingers ache in sympathy! Will you re-prune the wisteria this summer, when the wispy new leads have to be cut back to 7 buds, to ensure flower the following spring? I admired a flowering Wisteria frutescens at the RHS Garden, Wisley, UK, last summer. It's a handsome thing, with nicely bunched racemes in a rich mauve-blue but in a completely different league from the sublime Chinese and Japanese species. (I hope it would not be unpatriotic for a good American to say that! - but then, I'm English, so I guess it doesn't count. We have a spring-like day, today. And that bodes ill because March is supposed to 'come in like a lion but go out like a lamb.' If it starts mild, the end of the month can be a stinker. You are a busy lady. There is a wild wisteria that grows up an electrical pole across the street from my house. It is so beautiful in the spring. One of these days the electric company will come along and prune it no doubt. That was a lot of prunings of the wisteria. A job I hate to do no matter the season. Very nice shots of the hawk. They are such magnificent birds. I think you should get double volunteer hours for working so hard in the snow, Monica! Wouldn't I love to have a pergola like that for climbing plants! I hope you'll show us a photo of the wisteria in bloom this summer. I've seen a few hawks around here the past few months, but I can never get my camera out in time. They're always too far away for me to try to identify them, as well. Would love to grow wisteria but, alas, none. Wow, what a heavy punning job, Monica. I can only imagine how lovely the blooming arbor will be (please share). Happy sunny Michigan March morning (isn't today gorgeous as is the remainder of the week predicted to be)! Now this is a marvelous idea -- getting in your Master Gardening hours in the off season! I am a horrible MG participant because my group is in the Salt Lake Valley where 100+ temps are the norm. I melt in that heat and so avoid those summer chores at all cost. What a fun post. I wish I could have more success with wisteria. It does well in the valleys but doesn't seem too thrilled with my mountain garden. Ihr habt aber jetzt noch ganz schön viel Schnee! Bei uns ist er jetzt völlig verschwunden, aber es ist trotzdem wieder sehr kalt und wir hatten einen schweren Sturm gestern. Eine Wisteria hatte ich mir früher immer gewünscht. Aber sie ist eine ziemlich kräftige und starke Pflanze, aber wunderschön, wenn Ihre Blüten herab hängen. Ist Deine Gelb oder Blau? Brrrrrrrr! Look at that snow! You are a very brave lady climbing that ladder! Last time I tried something like that, I wore a lovely cast on my arm for 6-8 weeks. I am not allowed to climb ladders or use the beveling cutter to make mats (don't ask). I watched your video of Scorn of Buck thorn. I am sure one of the major record labels will be calling you soon to sign you up. I laughed, I cried, I thought it was great! Great pics of the hawk even though through the glass. You managed to be at the right place at the right time with camera. I have had them swoop down in front of me and pick a bird off the birdfeeder, and once off the rose bush, but I was so shocked had I been holding a camera, I would have dropped it. Happy MARCH (Yay) Mish-Mash Monday to you! I don't know how you do it - all that work in the snow. I would be a basket case in front of a fire, I'm afraid, lol. Good primer on wisteria pruning. Unfortunately Chinese wisteria is very invasive here. The neighbor has one that got away and we spent our first two years here removing it from our trees. Now we only get the occasional plant popping up from seed, which is easy to dispense with (if I catch it in time). We call people that golf in the winter diehard golfers. Well, you must be a diehard gardener to work in the garden with snow on the ground, lol. I probably could not work with such a heavy coat on my body. I need room to move a bit so kudos to you and the gang for doing this great pruning job! How could I have missed the video? It's awesome! I love Wisteria and can imagine how beautiful that arbor looks in spring. BTW - I use the old Blogger editor too. I'm used to it (I must be turning curmudgen). I hope the wisteria blooms eventually. That thing is a monster. An 8 foot ladder? You're brave, I can't even get on a 4 foot ladder. Hi Monica. Thanks for the tip on the give away. I've always loved the look of blooming wisteria but hear it is difficult to maintain and control. I almost never manage to get a good photo of my resident hawk. Very shy birds. Those hawk photos are so fun! I wish one would sit right outside my window. We had one on top of the bird feeder once... I wonder if the hawk was wondering why all the little songbirds wouldn't come to feed. I want to see that wisteria when it blooms. Have you heard that Benny Andersson has a new CD out? I am surprised wisteria grows so far north! I know someone that grows it here, but it never blooms for her. If only I could grow Wisteria here, I would. I'd love to see pics of the Wisteria once it is in leaf (and especially if it blooms). Your book is a great resource for winter seed sowing. It is well illustrated too, which is a big help for those like me who do better with illustrations. Monica now this is what winter gardening is all about! Love the warm ski pants on the one with back to camera..no cold bones there. You seem to have so much MORE snow in your world...is there a winter thaw anywhere! Here most of the snow has melted but still I search for signs of Spring in my garden! Monica you are such a brave, hardy soul venturing out in those conditions to prune - I am full of admiration. Glad that you have solved your Blogger problem - I am using the old editor too.